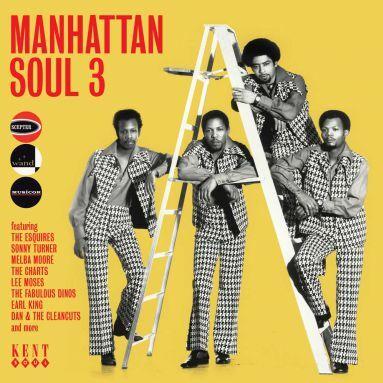 These New York labels were at the inception of soul music and continued to release excellent tracks until the disco era. Scepter/Wand and Musicor/Dynamo were quintessential New York soul labels. Their common link was Luther Dixon, who set Scepter on the right path with the Shirelles and followed up with success for Tommy Hunt, Chuck Jackson, Dionne Warwick and Maxine Brown. He split for Musicor in 1966 where he got the Platters, Tommy Hunt and Inez and Charlie Foxx back into the charts. Over the years, our privileged position of accessing the labels’ tapes has enabled us to make many previously unissued recordings available. This CD alone features an unheard Chips Moman song from Helen Henry, the Shirelles’ take on Luther Dixon’s superb ‘Two Stupid Feet’, songwriter Van McCoy’s own interpretation of the Shirelles’ ‘What’s The Matter Baby’ and an R&B group sound from the Tabs. Earlier vault discoveries from Junior Lewis and Big Maybelle are given their first CD outing. R&B is also provided by Billy Adams on a hip and raunchy nursery rhyme-themed number and the Soldier Boys, an early 60s doo wop supergroup consisting of Wally Roker from the Heartbeats, Don Covay and John Berry from the Rainbows and Robert Spencer of the Cadillacs. Ex-doo woppers Brenton Wood and Harold Hopkins demonstrate how pop-soul should be sung. Rare vinyl is represented by beautiful ballads from Sonny Turner with ‘Now That You’re Gone’, Billy Byers’ ‘Remind My Baby Of Me’ and Dan and the Cleancuts’ ‘Open Up Your Heart (And Let Me In)’. The Charts’ ‘Nobody Made You Love Me’ and the Fabulous Dinos’ ‘That Same Old Song’ are now expensive dance tracks and the Esquires’ glorious ‘How Could It Be’ is currently enjoying many DJ plays on the rare soul scene. Gritty southern funk comes from New Orleans’ Johnny Moore (aka Deacon John Moore) and the highly regarded Lee Moses. The subtler sound of the south is heard in Earl King’s overlooked slowie ‘A Part Of Me’. Similarly neglected is Melba Moore’s pretty ballad ‘Does Love Believe In Me’ and Tommy Hunt’s ‘Lover’, a super song sung over the ‘Any Day Now’ backing track. This is Kent’s ninth various artists CD of Scepter/Wand and Musicor/Dynamo recordings and the musical standard remains as high as ever – a testimony to the great talent the companies employed.